~ the poor, the lame, the blind. BABY died first. Followed by the rest of the family, one by one. The coroner counted six in total as the autopsies took days- allowing the assailant to loom about undetected and left officials scratching their heads. The Greene family, completely destroyed in a matter of hours, never made it to church; the ceremony that was supposed to celebrate the baptism of Isaac, their newest addition. Their bodies were found later that day. CARBON Monoxide poisoning, known as the silent killer, accounts for nearly 200-700 deaths every year in the United States. Charles Greene, his wife Mary, and their four children are now part of that statistic. Perhaps more upsetting to those they left behind is how easily this could have been prevented. If Charles had only purchased the Carbon Monoxide detector his brother-in-law suggested, he and his family would still be alive. $24 could have meant the difference between life or death- he could have saved his children. The KN-COPP-B-LPM is an essential device to help warn you and your family of dangerous carbon monoxide levels in your home. 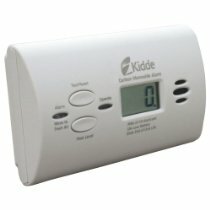 This alarm measures the exposure to carbon monoxide over time; it is designed to sound at 85 decibels at 10 feet when it detects 70 ppm (parts per million) of CO for 60 to 240 minutes, 150 ppm for 10 to 50 minutes, or 400 ppm for 4 to 15 minutes. The easily visible digital display indicates the level of CO that the unit is sensing, and it updates the status every 15 seconds for timely and accurate readings. Its free-standing design allows for attachment to a wall or placement on a counter or nightstand for convenient and comprehensive protection. The KN-COPP-B-LPM also includes a slide-out battery door that provides immediate access to the power source as well as a battery safeguard that makes it difficult to close the cover without batteries installed. An LED lighting system on the unit signals power levels and sourcing: the green LED will flash once every 30 seconds to indicate the alarm is operating properly when power is present, and the red LED will pulse to indicate carbon monoxide has been detected until the device is reset or the CO threat is eliminated. This device has an expected 7-year lifespan and comes equipped with a five-year manufacturer’s limited warranty. Don’t be a murderer, save your family now. No one wants to bury a child. Protect your family. They’re counting on you.